As life continually changes, sometimes constancy is important. 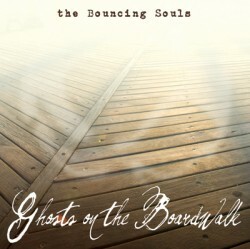 Putting in Ghosts on the Boardwalk, the twenty-year anniversary release from The Bouncing Souls, reminds me of times past. Not only does the band sound much like they did a half dozen records ago, but the release comes on their own label, Chunksaah, which started at the same time. This release, a collection of twelve tracks digitally released over the past year to celebrate their longevity, maintains their strengths and weaknesses, clearly showing that the band is content with their sound as is. As a collection, the cohesion is smoother than to be expected from the singles-release schedule. Seeing that the online releases included sixteen songs, the reduction of a few shows an attempt at crafting an album here instead of just slapping a few b-sides and some clip art together. Where the band has changed, at least since I last listened to them, is with the slower songs. The Mental Bits incorporates a back-beat, which is curious as Bouncing Souls are one of the few bands I was listening to in the mid-90s who didnt use such a style. Big Eyes is another slower song, which relies on a countrified guitar and Attonitos melodic delivery. Overall, Ghosts on the Boardwalk shows a band that is still interested in what they do without sounding tired or uninspired. While theres something to be said for consistency, the problem with this record that it sounds so much like Maniacal Laughter that Id rather listen to that instead. Posted March 1, 2010, 8:33 a.m.